Published: 2013-09-19, by Ana Gracia. 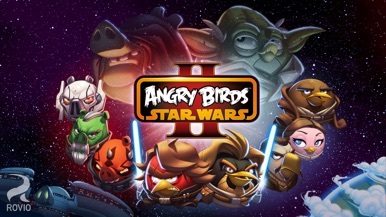 "Succumb to the dark side"
You were waiting for it and it is now here: Angry Birds Star Wars II is now available for download in your devices. This new adventure is based on the Star Wars prequels (The Phantom Menace, Attack of the Clones, Revenge of the Sith) and it's your choice to follow the right path or succumb to the dark side. That's right, as a novelty, this time you will be able to play as the pigs -the dark side- with Darth Maul and Emperor Palpatine or continue fighting against the dark forces and become a powerful Jedi. Discover the long list of new characters from the popular franchise and use them whenever you want, you can swap them easily and purchase your favorites. You already know how it works: use your preferred ally as a slingshot and aim at the evil creatures and its appreciated structures. It seems unbelievable, but we still haven't got over with our favorite birds, right? As you could expect, graphics are extraordinary, well-detailed and evocative even in the menu screens, there's nothing we would change. But one of our favorite features is still the magical soundtrack, which reminds us of our favorite space adventures and encourages us to continue playing and enjoying the experience. If you're interested in new ways of playing, you can choose to use the Telepods figures and have a different gameplay experience. In addition, you will also be able to enter ToonsTV, with an Angry Birds animated series. 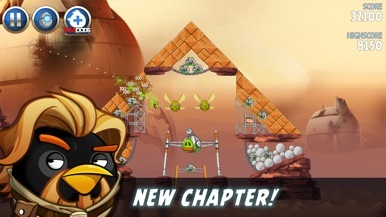 Rovio Mobile Ltd. is again the developer of the sequel of Angry Birds Star Wars, a wonderful new game of physics which gets you addicted from the very first minute. Don't miss it, join the dark side. 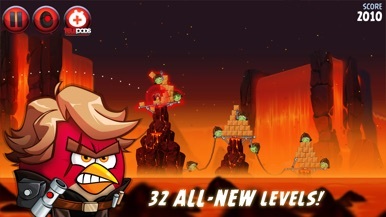 Angry Birds Seasons is back, quenching our thirst for extra-levels in this great game.. 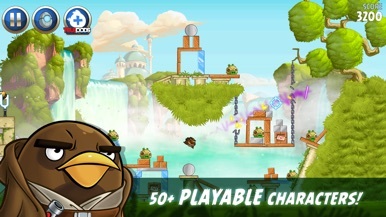 This new release of Angry Birds Seasons is a package with new levels that include new structures and challenges. The object of the game is still the same: to flatten all the green pigs in sight by launching the angry birds with a slingshot. A variety of birds wi…. Rovio's karting game. Here it is! [insert Angry Birds tune here] Angry Birds Go follows the scheme of any downhill racing game, conveniently revamped with the lovely green pigs and the mean birds. 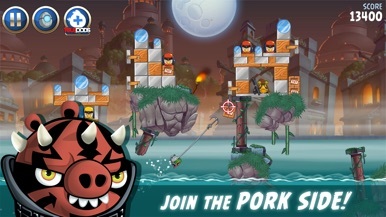 As any other game of the Angry Birds franchise, cartoonish eye-catching design and catchy canned tunes are the main attraction, but soon you'll discover…. Angry Birds Epic. At this precise moment, Angry Birds Epic has been soft launched -hereby being only available- in Canada, Australia and New Zealand. As soon as the birds find their way onto our devices, you'll be able to read our review here. Rating is just for completeness. It'll be updated at due time..